On the other hand, maybe they need to worry a little more in order to lose weight? Perhaps elect them to Congress? We would have real go-getters then, instead of weak drinks. LOL, thanks for making me smile! 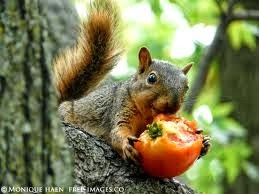 Caryn, it's comforting to know the squirrels of our mighty land are eating well, and that all red-blooded squirrels remain adamantly opposed to acting or voting against their own interests, as the Republican Party wants us poor humans to do and keeps fooling many of us into doing. 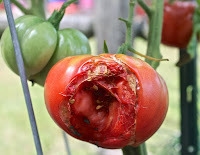 Here's a squirrel-bit tomato in their eye, and for the Tea Party a worse fate must surely be considered by the Great Council of U.S. Squirrels at their upcoming Confabulaba on the msll, n'est-ce pas? 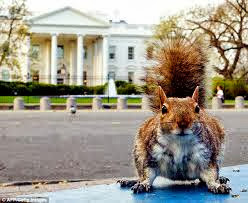 Those squirrels should eat the nuts on Capitol Hill but I'm not sure if the squirrels would like tea-flavoured nuts. Squirrels fighting partial shutdown by causing a tomato jam. Great read. thanks Caryn. If they bite into wingnuts, they'll hurt their teeth. Funny. Good writing. Keeps us from going nuts.